One of the advantages of living in Southern California is that you are close to so many different sports franchises, the Lakers, Clippers, Kings, Ducks, various teams from UCLA and USC, Angels and Dodgers to name a few. With that many different sporting options you are bound to encounter some historical moments. One of those happened Saturday Night. For those of us that thought we were just going to see a great pitching duel between Billingsley and Strasburg, we got the added bonus of seeing an amazing extra innings walk-off home run by Matt Kemp and perhaps the most significant, Bryce Harper’s MLB debut. Harper did well in front of a sold out Dodger Stadium crowd, hitting the ball hard, getting his first hit, a double into deep center, on his third at bat and throwing a strike from shallow left field to home that beat Jerry Hariston Jr. to the plate and would have been an easy out if Wilson Ramos had held onto the ball. Harpermania has been hot in the collecting world and today Topps announced their future plans for his cards including his exclusive autograph cards and to get these cards in collector’s hands ASAP. Bowman Baseball – In addition to having an Autographed Prospect Card in retail and a Bowman Black Autograph in hobby, Bryce will be Lucky Redemption # 2! 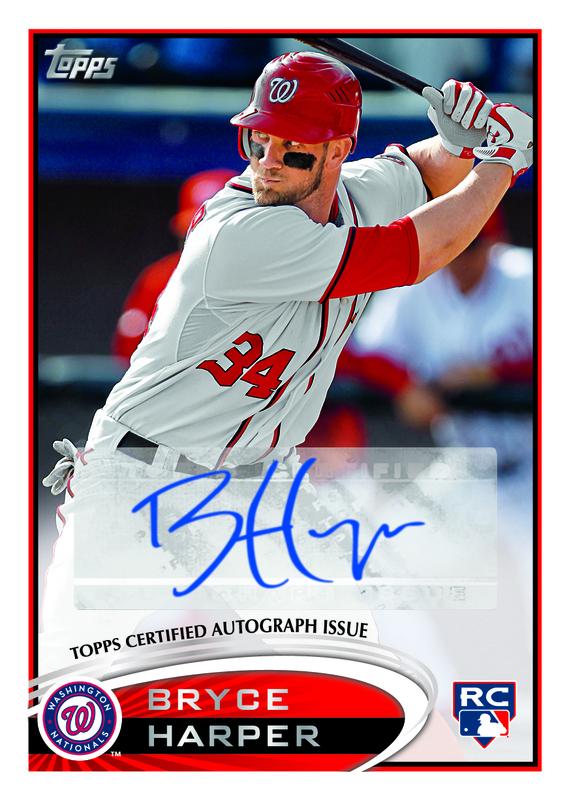 The card, which will be limited to 100, will feature Harper in the RC design and will include his Autograph. Topps Series 2 – Harper will be card # 661, but because of limited timing the card will be short printed. In addition, there will be an autographed variation of this Rookie Card in both hobby and retail. 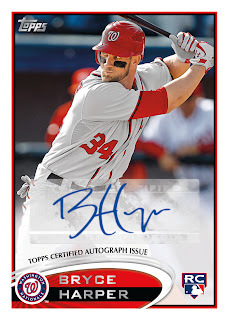 Topps Archives – Collectors will find redemptions in both hobby and retail for Bryce’s Fan Favorites autograph (on-card) and the young star will be included as a short printed base card (# 241). Topps Tier One – 25 redemption cards will be inserted into packs for his “On the Rise” Autographed Rookie Card (on-card). Allen & Ginter – A&G will include both Harper’s standard and mini base Rookie Cards at the regular rate. The product will also include Harper’s autograph. And for his Red Autograph limited to 10…those can be had by tearing open Rip Cards and finding the “Mystery Redemption” mini! Complete Sets – Find Bryce’s 661 card, but with an all-new image. In addition Harper will have Autographed Rookie Cards in the remainder of all Topps 2012 MLB products.